UKROBORONPROM State Enterprise “Zhytomyr Armored Plant” continues work on increasing effectiveness of the combat module “Duplet”, designed for modernization of armored vehicles. Demonstrated for the first time at the exhibition “Arms and Security-2016”, the combat module is optimized for use on BMP-2. If necessary, with minimal changes, this combat module can be mounted on other armored vehicles; For example, on the main battle tank T-64, turning it into a tank support fighting vehicle”Strazh” . During this time, “Zhytomyr Armored Plant” – using its own working capital – has been working to improve characteristics of the combat module. Specialists equipped the module with advanced fire system, allowing to track target in automatic mode, independently calculate ballistics and conduct accurate fire in all weather conditions, day and night. For this purpose, “Duplet” was re-equipped with a new thermal imager, allowing to recognize targets throughout the range of fire with all “Duplet” armament, including ATGM “Barrier”. And during “Duplet” testing – recently held at one of Zhytomyr region firing grounds – high efficiency of these solutions has been demonstrated in practice. The main “Duplet” armament: two automatic 30-mm guns with maximum firing rate of about 1000 rounds per minute. It takes “Duplet” one second only to fire 16 rounds at the enemy. Heavy fire allows to put fortified weapon emplacements, light armored vehicles, manpower and low-flying helicopter type air targets out of action. “Duplet” has a significantly expanded ammunition, allowing effective long-duration combat. And two automatic guns can work in turn, doubling continuous fire duration without overheating the guns. Duplet is also armed with an automatic grenade launcher, two machine guns caliber 7.62 mm and four ATGM “Barrier” missile launchers. “The “Duplet” combat module is an effective solution to improve the effectiveness of infantry combat vehicles. Combining heavy firepower with an advanced fire control system ensures high precision of target destruction from the first round. At the same time, Duplet meets modern requirements for defense development. 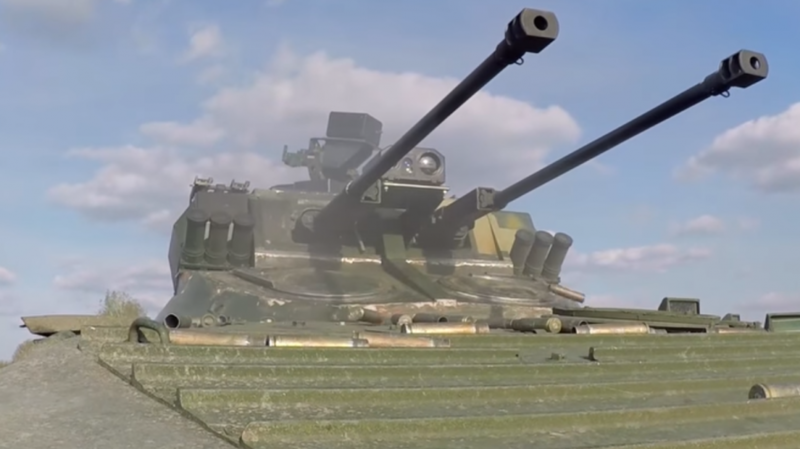 The solutions used allow to adapt it to many platforms – we are talking about the possibility of mounting it not only on IFVs and T-64, but also on other armored vehicles,” – stressed Pavlo Bukin, Director General of the SC “UkrOboronProm”.